I had already ordered the Apple case and charging dock at the same time as the iPad so I didn’t expect to be heading out quite so soon for more “office warming gifts” to help my iPad settle in. 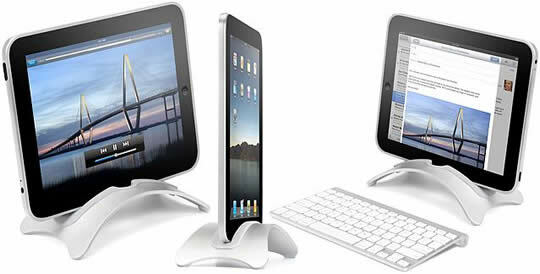 The problems with the Apple iPad dock were evident immediately. First, it was not designed to be used with an iPad in an Apple case so the case needs to be removed every time it’s used. 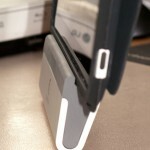 There is an alternative already adopted by many and that is to modify the case, making the cut out area around the dock connector bigger. I wasn’t prepared to do that and even if I had been it wouldn’t have addressed the other issues I had with the dock. My second issue was that even having taken the iPad out of it’s case, and that’s no mean feat as it’s a very snug fit, to seat it correctly in the dock, attempting to type on it was not a good experience. The whole iPad moves as you type on it, not dangerously so but enough to make trying to type on it annoying. 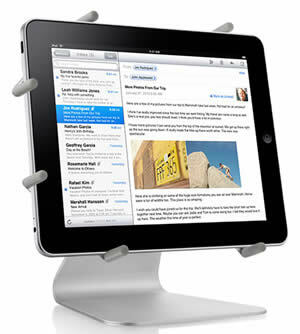 Last but by no means least was the fact that the dock does not allow the iPad to be displayed/held in landscape mode. Since it plays videos beautifully I anticipated using the iPad in landscape mode frequently. 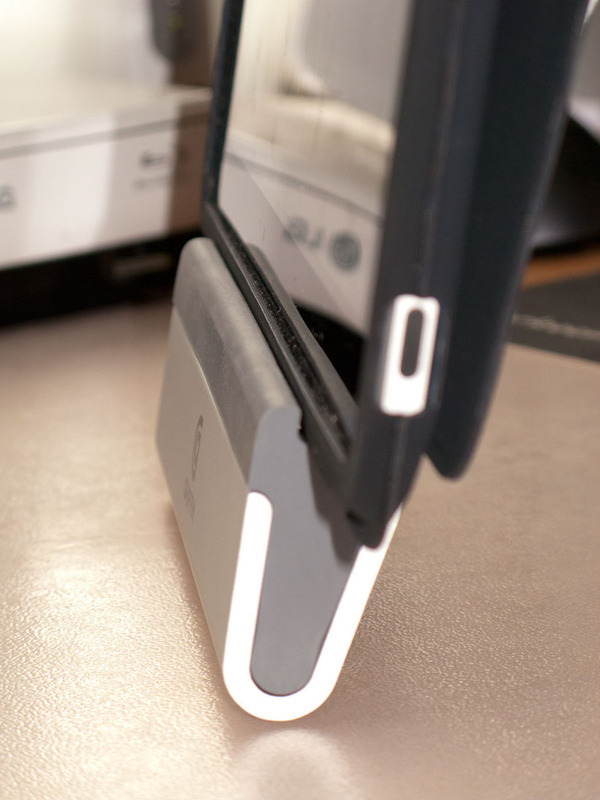 Although not specially designed for landscape display the iPhone dock will safely hold the phone in that orientation and I’d anticipated being able to use the iPad dock in a similar way. There are plenty of images out there showing the iPad in landscape mode using nothing more than the Apple case but after trying this I came to the conclusion that it was far from secure enough for my new toy. Talking with iPad owning friends I narrowed the choice down to 3, the Stabile, the Luxa2 H4 and the Book Arc. The Stabile is hardly portable at 4lbs and it also needs a lot of valuable desktop space. As for the Luxa2 H4, call me shallow but I couldn’t get past the “pegs” that hold the iPad in place, in fact after a while the “pegs” were all I could see. That left the Book Arc which looked like it ticked all the boxes. Only problem seemed to be nowhere had any in stock yet. Roll on Saturday morning and an emergency trip to the Apple Store was needed (no REALLY needed … honest!) so while there I of course perused what the accessories section had to offer. Surprisingly they had the Book Arc in stock and the staff were more than obliging in permitting an unboxing to test it out. That was when I realized I needed to add another requirement to the list – I really wanted to be able to use it without taking the Apple case off the iPad. The Book Arc is really nothing more than an arc of metal with a large slot cut out. 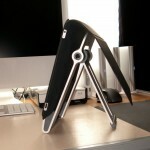 The cut out is edged with a grey latex insert, the function of which is to protect the iPad from damage. There are actually two of these latex inserts in the box. 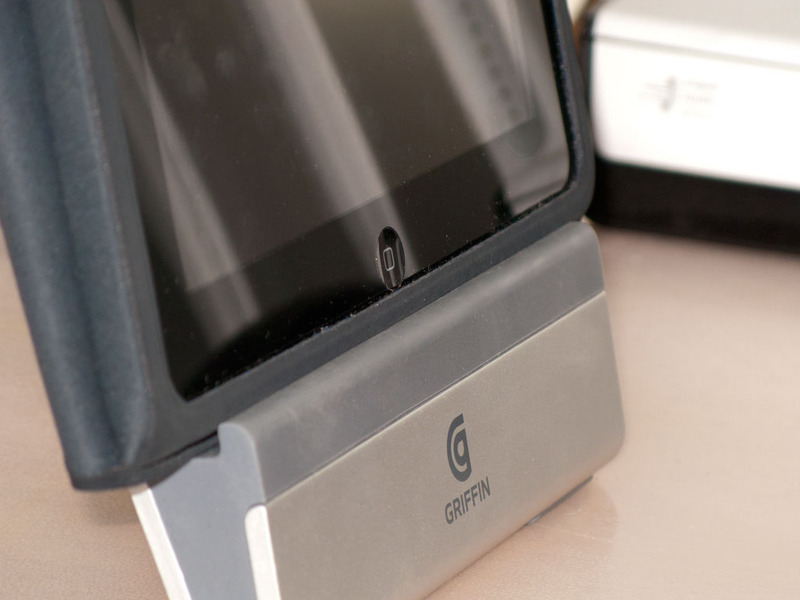 The first is used when the iPad is case-less and the second had a wider gap to allow it to be used without the need to remove the iPad’s case before use. Since I had my iPad with me I was able to test this. Without the case it worked well, there is a cut out to allow access to the home button and the viewing angle can be adjusted albeit only very slightly. 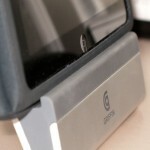 It was very neat, completely portable and allows the iPad to be charged in both orientations. It looks beautiful and feels like Apple themselves have made it. It wasn’t perfect though, the angle it held the device at made it difficult to type on and when you did there was too much movement in the iPad. Changing the latex insert I tried it with the iPad in it’s case and things got worse. 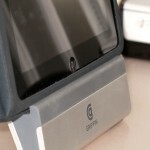 While the insert might work perfectly well with a skin type of case it clearly wasn’t made with the Apple case in mind. 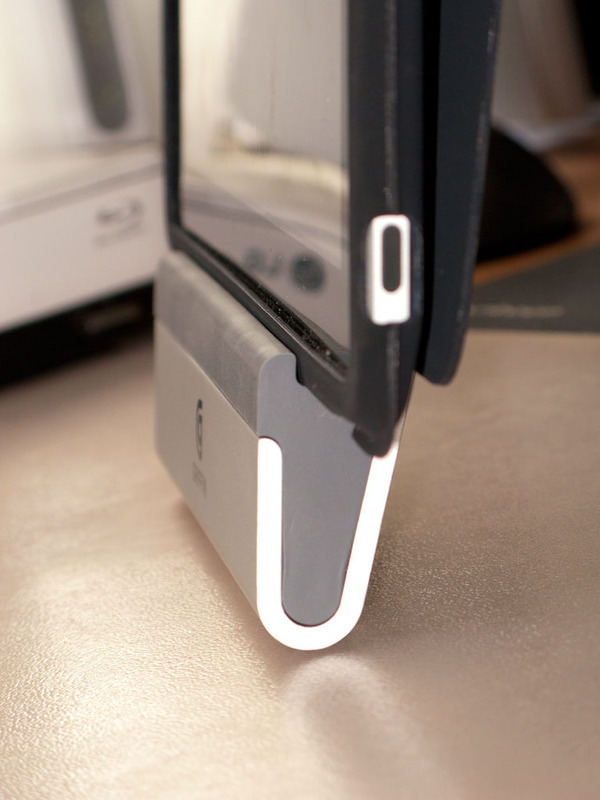 It would just about fit into the gap but it was too tight for comfort and seemed to force the iPad to lean forward. I was disappointed but luckily while I was considering what other options there were my eye caught something from Griffin and it’s perfect. 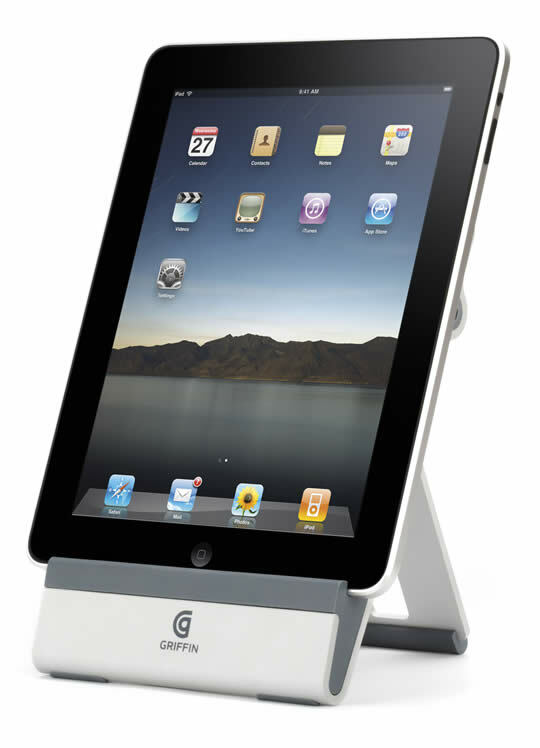 It’s a Griffin A-Frame, best described as a small copy holder for your iPad. It’s 100% solid to type on in both portrait and landscape modes. 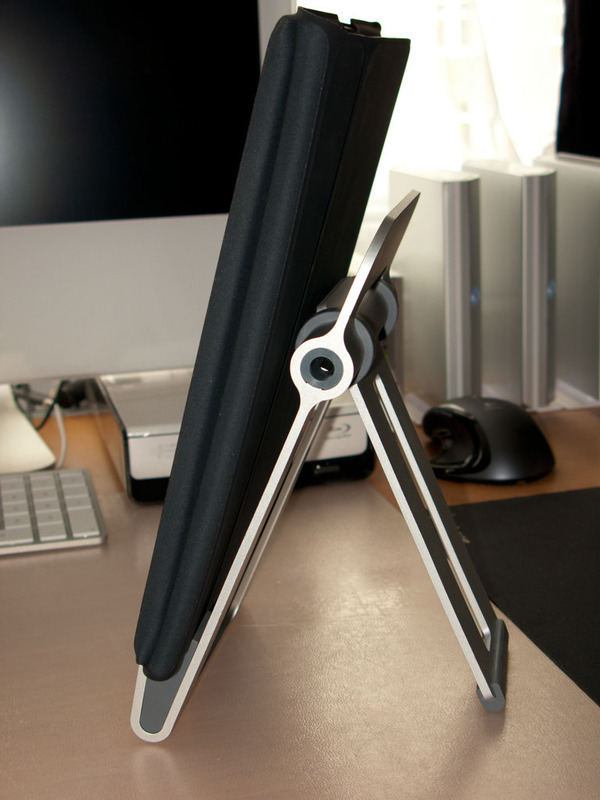 The viewing angle adjusts more than you’d imagine by moving the leg at the back. 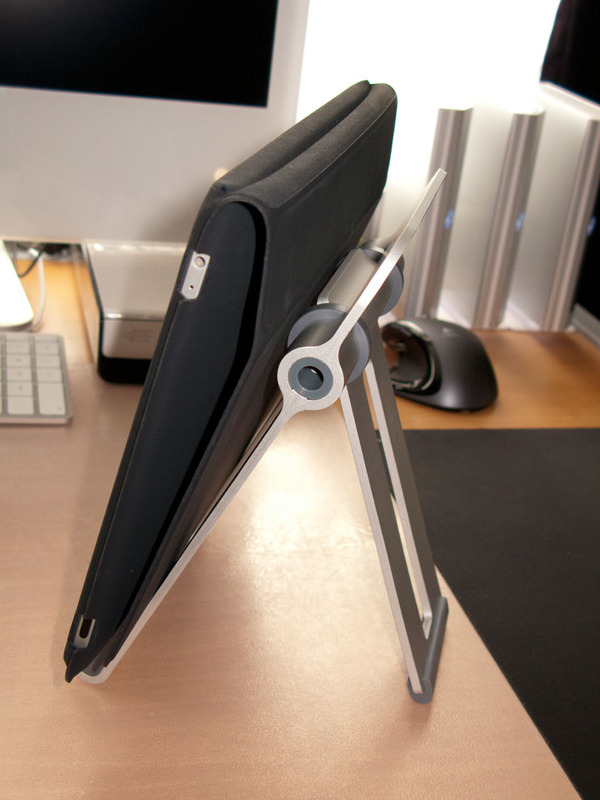 The stand is substantial but not so heavy to not be portable. 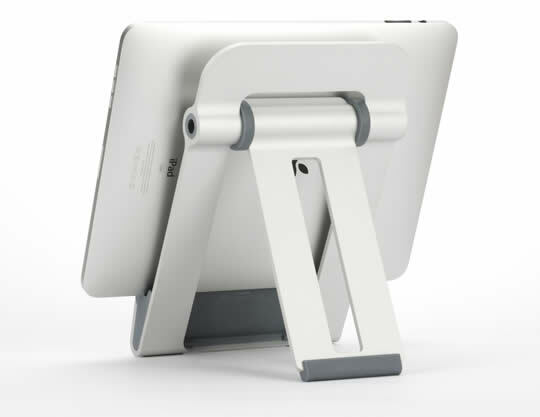 It has integrated rubber feet which hold it in position and a rubber shelf that the iPad sits on. 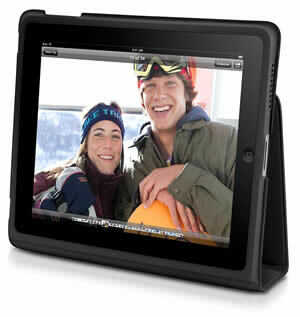 It also has rubber back supports that ensure case-less iPads are held securely without damage. There’s integrated cable management via the leg at the back. 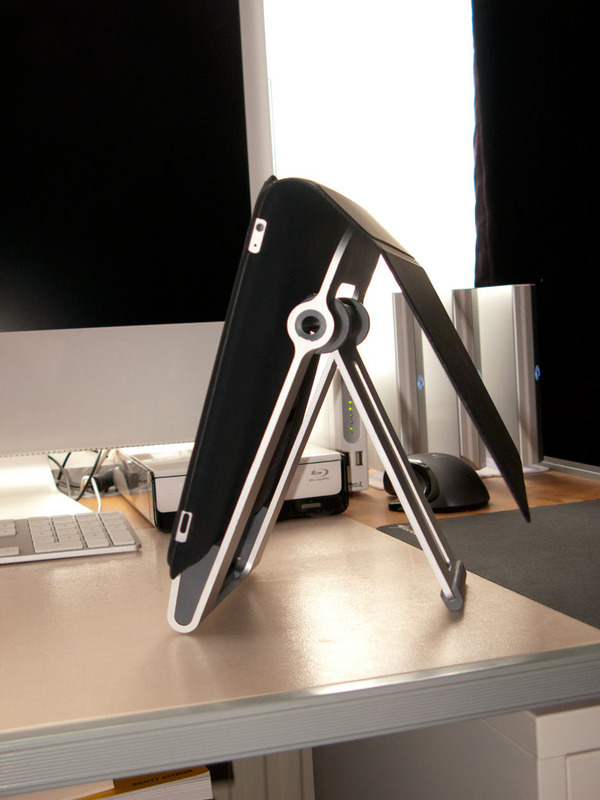 The A-Frame is equally usable when the iPad is in the Apple case holding it comfortably in place with the front flap folded in behind the iPad or dangling over the back. Amazingly it didn’t end there though. The Griffin A-Frame had some extra benefits I hadn’t included in my original list of requirements. 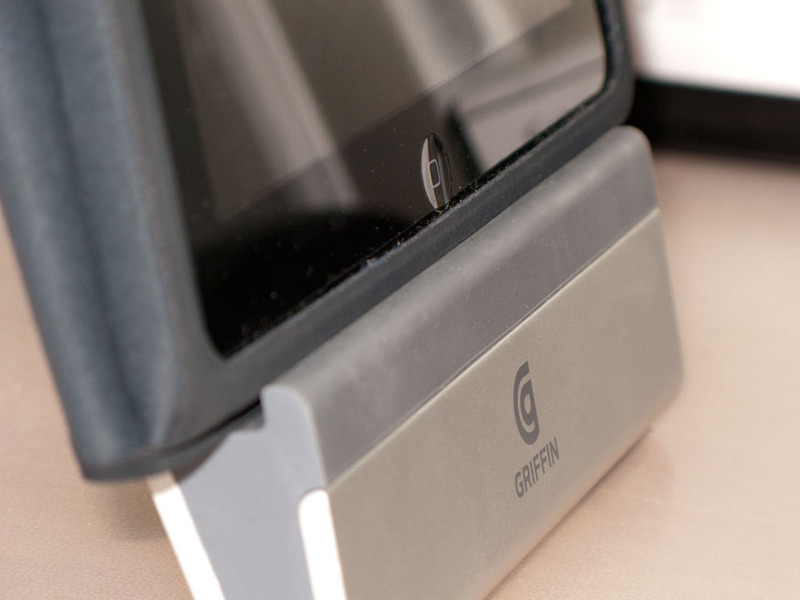 It can be folded to lie flat which raises the iPad just enough to create a comfortable typing angle, it folds flat for travel and holds the iPhone in portrait mode which is great for TV/video watching. It was £39.95 in the Apple Store which was £5 more expensive than the Book Arc, priced at £34.94. Prices at various online stores were considerably lower at £29.95 but they had none in stock. Also thought I’d add a few more photos for those folks who have asked what the iPad looks like on the A-Frame inside the Apple Case. Curious about one thing with the Griffin A-Frame. When it’s laid down does like in your last picture does the bezel/end stop bit get in the way when typing? 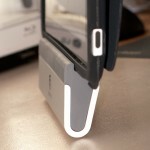 What a great idea removing the silicone insert is & why didn’t I think of it? Probably too concerned for the safety of my baby in the middle of crazy busy Apple Store! Thanks for your very kind offer and of course I’d love to try it out for longer 🙂 The photo of yours make it look like it’s working well. I don’t expect I’ll use much in that mode but who knows it’s early days! 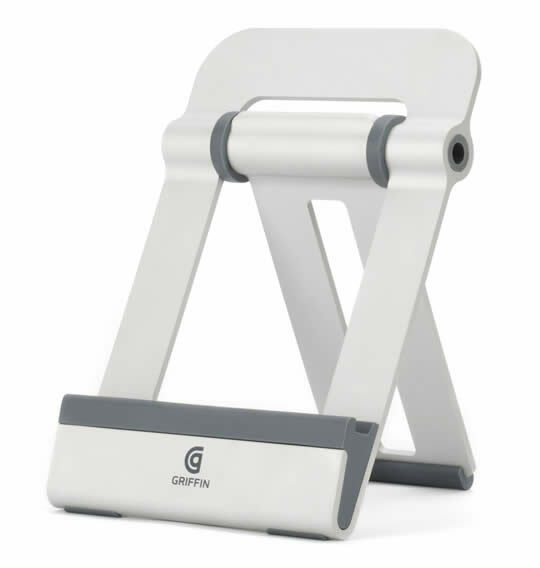 It’s sturdy enough to type on when in the stand, comes in a nice box that you can use to transport it, and holds the iPad in both orientations, at three different angles, and still in the Apple Case. The Cylon stand is certainly flexible from the images on their website and I like the fact it dismantles for transportation too. 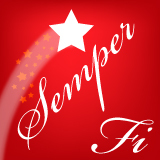 Feel free to send a photo and I can add it to the post if you like. I’ll be updating the post with a couple of other stands people have mentioned shortly. 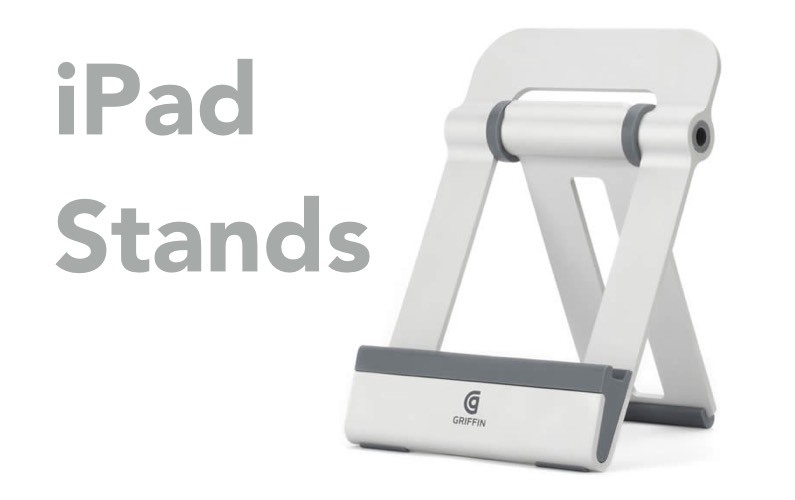 I have been looking at this stand for a while, your review has sold it, just bought one on Amazon!